You can watch all my music videos on my awesome Youtube channel. ‘Fun, catchy songs make for great memories’. Stream the album via Spotify, Deezer, Amazon etc. CD’s are shipped worldwide via Amazon and CD Baby. Download from iTunes, Google Play, AmazonMP3, 7DIGITAL, Bandcamp etc. Subscribe to the newsletter to get an email whenever there is a new song or video available. My kids show Dino Park contains fun dinosaur facts for kids. 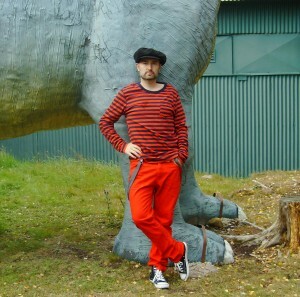 It was filmed at Europe’s biggest dinosaur exhibition ‘A World of Dinosaurs’ in Sweden. Here are all episodes, free to watch. WHO IS DADDY DONUT? WHY DINOSAUR SONGS? I’m Daddy Donut, an independent artist from Sweden. My aim is to create really good dinosaur songs for kids as well as fun, educational videos about dinosaurs. It all began when my oldest son turned four and became fascinated by dinosaurs. My own fascination was also renewed and I started writing songs about dinos. It all coincided with a period in my life when I decided to quit my day job, follow my dream and make music full time. I wrote it in Swedish but simultaneously worked on the English version. When the album was finished, me and my son recorded a simple music video in the Park one day where I was chasing him with a puppet T. rex. I uploaded it to Youtube and pretty soon it was gaining a lot of views. We made another video for Tyrannosaurus Rex and things went crazy with millions of views on Youtube. I also started doing live shows in Sweden and today I have one of the most successful music shows for children in Sweden. In 2016 I did over 150 shows! So there was not much time for making Youtube videos as you understand. The album ‘Dinosaur Songs’ features pop and rock songs about the most famous dinosaurs: T-REX, Brachiosaurus, Brontosaurus, Triceratops, Ankylosaurus. There is also a lullaby for a Pterosaur even though they were technically not dinosaurs but a different species. On the album you will also hear about some some lesser known dino species like the itsy bitsy Tinysaur and the self-centered Egosaurus. The lyrics are fun and slightly educational. Dinosaur Songs for kids was released in August 2013. It is widely distributed through iTunes, Amazon mp3, Spotify, and most other music stores for online and mobile music. It also has worldwide CD distribution through CDbaby. I hope my music about dinosaurs finds its way into the hearts of kids and parents all over the world. Stay tuned for new dinosaur videos and other fun stuff. DINOSAUR SONGS – probably the best children’s album in 65 millon years! Read more about how I wrote these songs about dinosaurs for kids. Watch the video for “Running from a T-rex on Youtube”. You can watch all my music videos on my awesome Youtube channel. There you will find videos like Running from a T-rex, Dino Blues, Tyrannosaurus Rex, Trixie Triceratops and many more.